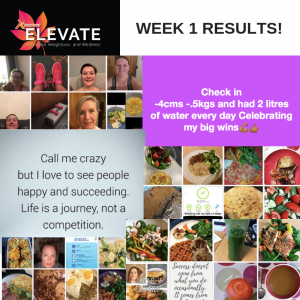 WOW check out some of these fantastic results from week 1 Elevate with Rachel Holmes. Elevate is a weight loss and wellness overhaul programme with Rachel Holmes online. The team have a daily selection of workouts and a nutritional protocol to follow, the nutrition is flexible and aims to help the team workout what works for them! Results day. 4lbs of the 6 I gained over Christmas gone. 3lbs and 7.5 inches off. 3 inches down from stomach area. Lost 1.5kg this week, so pretty much back to pre-Christmas Elevate results. 1.5cm lost. This week, 2lb’s down & a 2″ inch loss. Feeling stronger, freer, less bloated by a million miles, and back in the game! So weight is down to 11st9 so 5lbs down. Overall 4 inches off so not a bad start! My brunch! Small afternoon seaside walk was very windy but feel so much better for some sea air! Chicken breast and veggies cooking for dinner. Pretty decent week. Lost 3lbs, ate something green every day (my self imposed daily goal), had my 2 litres of water every day. Feeling much better than this time last week! !